I started this back in June 2015, and have been keeping up with it this past month. I've kept reducing my goals due to real life, and I think I hit a stride heading into December, and have kept it up for the most part. Well, except maybe on the blogging end and the goals posts the past two months! Start working on crafting professions to clean out retainers (max of level 15) Started! Finish Men of Yoshiwara Completed! Finish all of Impey's endings (including GCs and video) in Code Realize Completed! Start Victor's route in Code Realize Completed! Start Amnesia: Memories (suggestions on the card suit to pursue first are welcome!) Changed game. I ended up completing quite a few goals, though mostly outside of MMOs. Real life was busy again. Actually, it doesn't ever seem to slow down, any. Granted, it should be a tad bit slower this month compared to the past few. Chaide and I finished the base-game story!!! So I didn't get very much done in WildStar. Partially was just real life, and partially was just I've been working on ThaydFest stuff non-stop. I'll probably adjust my goals there knowing that ThaydFest won't be over until end of May. 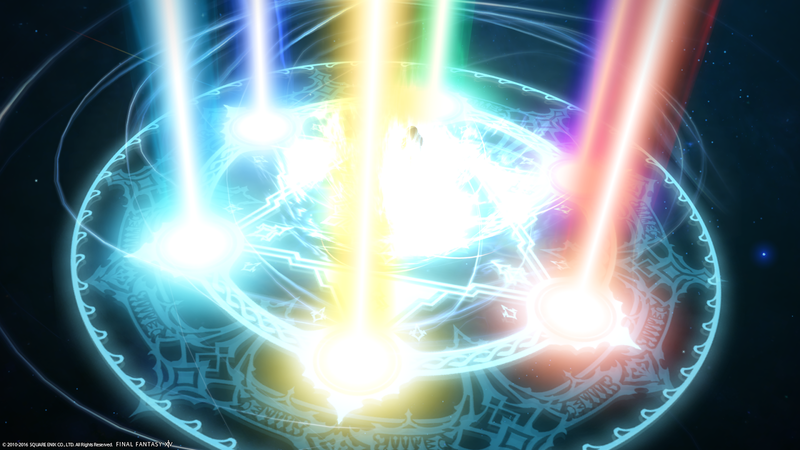 We finally got our main classes to level 50 in FFXIV, and we've been working past the 2.0 story very slowly. We're currently about halfway through the "A Realm Awoken" patch. We're currently stuck on the "Rock-solid Protection" quest, (1) because of time and (2) we can't figure out if we need normal or... hard mode? I think it's called hard mode. And needing normal makes no sense since it's a level 45 dungeon. So if you have thoughts, let me know. I almost got my gathering professions up, so I might continue those goals. My play time has decreased there overall, so I'm not sure adding a new class to level would be wise. Maybe I'll think about how much story we can feasibly get through this month and use that as a goal instead. We're almost into Transylvania in The Secret World, but I just haven't had much time outside of work to work on the videos without also cutting into my gaming time, or time spent with Chaide in general. My other gaming goals were fairly easy, honestly. I was a terrible person and left Men of Yoshiwara: Kikuya minimized during raids and pulled it up whenever I was dead. Honestly, it's what keeps me so jovial during raids, because I hate dying. And Code: Realize was easy, because I play that for an hour every day at work during lunch. Plus, if I carry my Vita with me everywhere, so if I'm waiting in line or something, it's easy enough to pop out and play some. I'm at the point where I'm almost done with Lupin's route, and I'm sad to see the game end! But more thoughts on that another time. 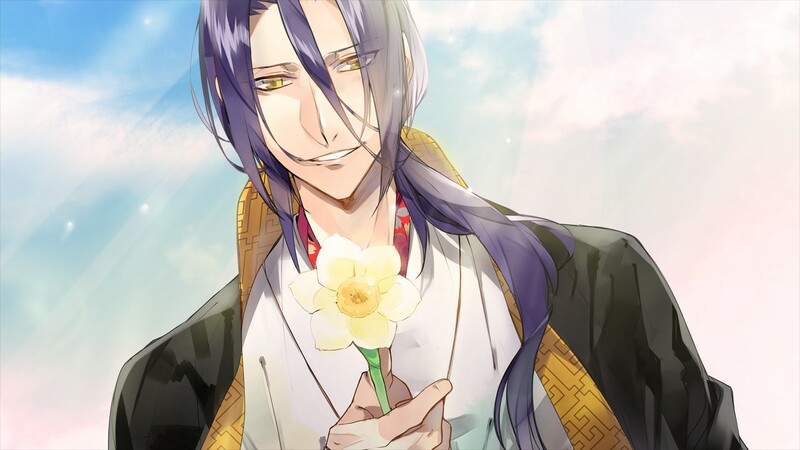 I decided that instead of playing Amnesia first, I'm going to be playing the new Men of Yoshiwara that just came out a few weeks ago. I got it day-of because it was on sale, but I was up in the air on which otome to try next, until Sushi told me about how one of the routes is right up my alley (I love the sweet romance/childhood friend routes), so now I have to try it first. I also picked up Stardew Valley and Atlas Reactor these past two months. Stardew Valley is lots of fun, but it's something that I can only really handle in small doses. I just get bored with it after a few hours, and need to put it down. Plus I stink at the whole relationship building thing, and after a while I start to feel overwhelmed at all the things to do and that I want to do and... yeah. Atlas Reactor is one that I was lucky enough to get a beta code, and I have lots to write about it, but I've not had much time to get in there and play around with it more to solidify the thoughts and guides I want to write. Overall, I love it because it's more thought- and strategy-based than MOBAs in general. Or at least from my limited MOBA experiences. I've tried HotS and LoL, but neither caught my fancy. I don't like the way it works, and it's super confusing, whereas I caught onto Atlas Reactor really quickly, and it almost feels like a team-based game of chess. 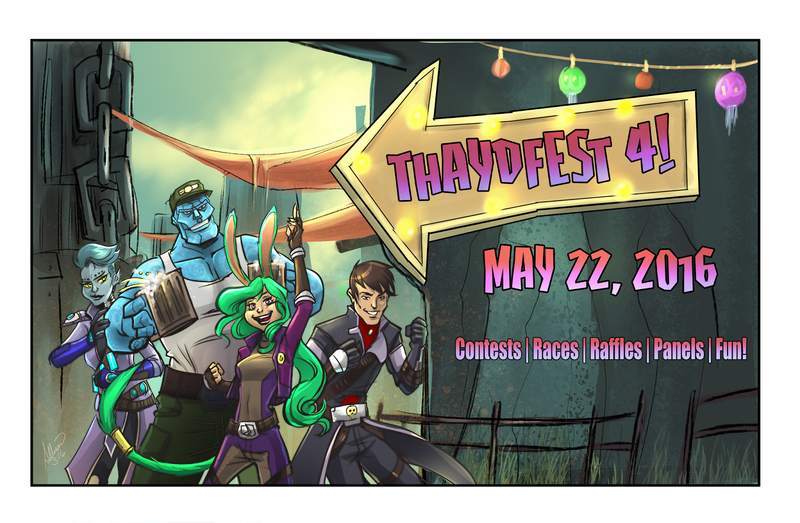 Thank you to the wonderful Ammo for the beautiful ThaydFest banner donation! 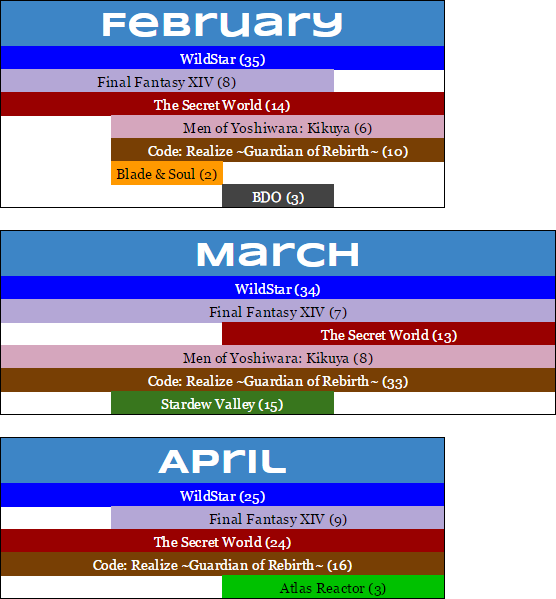 The month of May is going to be taken up mainly by ThaydFest, so I don't know that I'll have a lot of goals for May, but June will have countless hours to fill in, because Chaide is going to be teaching in Africa for two and a half weeks straight... so I'll have lots of time to game (and be sad) and put together Let's Plays.